Biscuit malt, come on down! It's your turn to be smashed, steeped, and then drunk! Let's look at biscuit malt today. This is a favorite of mine. I have met people who hate biscuit malt, people who love biscuit malt, and people who use it to the point of excess. Perhaps the latter tend to create the former. With moderation, it does add a unique component to a recipe. Biscuit malt is actually a type of roasted malt, but is roasted to a very light degree at around 25-30° Lovibond. Roasting temp is around 350°F, which puts it somewhere between a high-kilned malt like Munich malt, and a roasted malt like pale chocolate, which might give you some idea of its characteristics and usage. 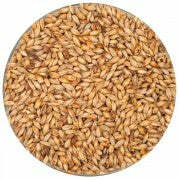 It is a Belgian malt, so it can be used in a number of Belgian ales, as well as most English and American ales. The flavor may be a bit strong for most lagers, but light-colored or dark ales of almost any nature can make a home for biscuit malt. You can pair it with dark roasted malts for some depth of flavor, or in something like a pale ale to add some toasty, bready character without adding color. Biscuit malt is aptly named for the biscuity flavor it imparts. It's also sometimes described as a "saltine cracker" flavor (which I think is more fitting than "biscuity"). After crystal malt, I would guess that this is one of the most commonly used specialty malts, but as a new all-grain brewer, I remember being a bit gun shy about using it. While you can go overboard with biscuit malt, it's not as strongly flavored as some specialty malts. One pound (or around 10% of the grist by weight) is about the most you would ever want to use in a five gallon batch, and about a half or a quarter of a pound is enough to get some of that complementary, biscuit malt goodness. I would recommend using this great malt with responsibility while you're getting a feel for it. Some people will add biscuit malts to low-gravity bitters, milds, and brown ales to increase the malt component of beers with small bills. If you want a really malty beer, and you're already brewing something that's 1.070, adding biscuit malt may create that overly malty or cloying perception that some people associate with biscuit malt. So keep in mind what sort of beer you're using it in, and how much malt and biscuit character will already be coming from the base malt or the malt extract. So all in all, while you can go overboard with just about any malt, most when used with purpose add another dimension to your beer, and ultimately add another tool to use in recipe creation.